In June 1940, during the Dunkirk evacuation of Allied troops to England, French sergeant Julien Maillat and his men debate whether to evacuate to Britain or stay and fight the German troops that are closing-in from all directions. 1964 : les meilleurs films de l'année. In 1943 in Tunisia, a unit of the French Foreign Legion fights the Germans over possession of a bank treasure in gold bars. A rough trucker assigns his new truck and its mysterious cargo to his newest employee, only to see it hijacked by one of his experienced drivers. Now, his friends are after him to retrieve the goods. Are 100,000 dollars worth dying for? Commissaire Letellier and Inspector Moissac are tracking Minos, a serial killer whose victims are women. Commissaire Stanislas Borowitz is going undercover as gangster Antonio Cerutti in order to expose corrupted policemen. For more than 15 years, two Marseille friends and criminals battle the law, rival gangs, prison authorities and even mined beaches in order to survive. The farcical adventures of unhappy suicidal billionaire Arthur Lempereur. It is really amazing that what was one of the biggest popular successes of the 60s in the French cinema has only one review on the IMDb! So here is my little contribution. For those who have seen the recent "Atonement", the story will look familiar as the film is about one of the darkest episodes of WWII (i.e. the retreat of British and French troops at Dunkirk in June 1940), an episode evoked perhaps too briefly in the British film. In June 1940, British and French troops fighting against the Germans in Northern France were forced to retreat to the coastal town of Dunkirk and its suburbs. Their only hope of escape was to cross the Channel to England, but the boats were scarce and all the time they were attacked from the air by German fighter planes. This is literally the background for the whole movie. During two hours, we follow a young soldier named Julien Maillat through what was actually a terrible mess. 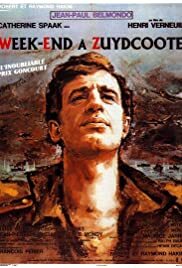 Based on the first novel by Robert Merle, which was awarded the Goncourt Prize (the French equivalent of the Pulitzer Prize), "Week-end à Zuydcoote" is a realistic and grim portrayal of war. Merle himself was trapped on Dunkirk's beaches in 1940, and this brought a touch of authenticity to his work. Besides, when most war films depict glory and victory, this one is about defeat and loss. Therefore, the movie is not about battles between armies of nameless soldiers; it shows instead the boredom, frustration, fear and anger of ordinary human beings - all compressed into a turbulent two day period. That being said, don't expect one of those French "high brow" films! Henri Verneuil was an excellent filmmaker who knew how to make a real blockbuster (as this one proved to be). Although I never regarded him as an original nor even a prominent director, "Week-end à Zuydcoote" is perhaps his best effort. Well served by an excellent cast (leading man Jean-Paul Belmondo in one of his best parts, Jean-Pierre Marielle, Pierre Mondy as a gradually repulsive swindler...), the movie has benefited from Henri Decaë's exceptional cinematography and Maurice Jarre's fine score. Verneuil has managed to construct a believable reconstruction of the episode, which matches some of the best Hollywoodian movies on that period. The weak point (and this prevents me from giving this movie a 10/10) is the story that unfolds around the encounter of Maillat (Belmondo) and a young woman (Catherine Spaak) who resolutely refuses to leave her home in the suburbs of Dunkirk. This part of the movie seems artificial. While Verneuil is very good at depicting the protagonists' experiences, he proves to be clumsy with this segment. In spite of this minor flaw, "Week-end à Zuydcoote" is a thoroughly enjoyable show and a bitter reflection on war. 32 of 34 people found this review helpful. Was this review helpful to you?